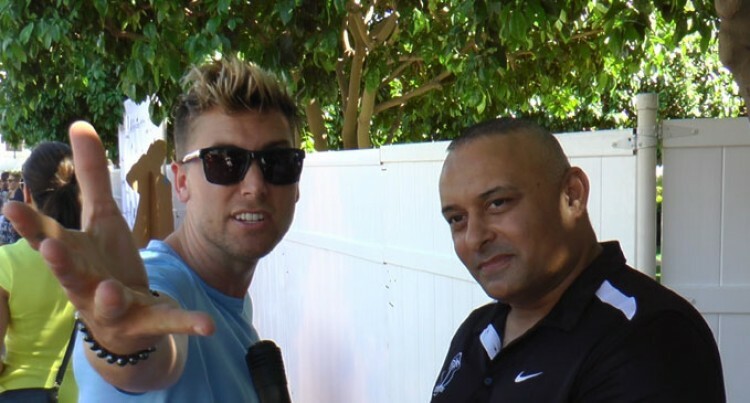 Lance Bass (left), with Ajay Bhai Amrit. When you mention boy bands the name NSYNC comes to mind with their huge hits and larger-than-life band members like Justin Timberlake and Lance Bass. The band had a huge following globally during the late 1990s and early 2000s and sold millions upon millions of records worldwide during this time. Lance Bass was one of the prominent lead singers of this band, who captivated audiences with their fresh and exciting dance moves as well as their immaculate appearances, in the public and personal arena. Their music was harmonious and fresh – something that was needed as the new millennium took grip of everybody as we all looked forward to the future. James Lance Bass was born in May 1979 in Mississippi to a devout Christian family where his father James Irvin Bass was a medical technologist and mother Diane was a Mathematics and English teacher. He grew up with his parents and older sister Stacy and described his childhood as “extremely happy”. This was because of the strong family bond which still exists today. He sang in church and as a child and it was through his singing that he was first noticed. In 1995 he was approached to audition for a new boy band called NSYNC and the rest, they say, is history. Over the next few years Justin Timberlake and Lance Bass surfaced as the band’s main attractions as they gained fanatical following firstly throughout Europe, then America and finally global recognition as the world’s number 1 boy band. In the year 2000 NSYNC released the song “No Strings Attached”, which became the fastest-selling record of all time – smashing all records previously. After seven years of unparalleled success the band decided to take a break and went about their individual careers. This in fact would be the final time the band would play together and as of now there has not been a reunion of the group. When I met and interviewed Lance it was a surreal feeling because I remember him always being linked to NSYNC and nothing else. In fact he has so much more to offer than this part of his life. I must admit he instantly grew on me as a person who was a very pleasant soul. We talked about his time in the band and the break-up of the group, where there was some bad feeling between band members and a feeling of being let down. Ultimately though Lance decided to summon up his faith and put into practice what he had learned all those years ago in church. The lesson he learned in church was forgiveness and today even though the band are not together Lance is very close to all of the band members and in fact still considers them as best friends. It was through letting any ill feelings go, that he was able to move on with his life in a very positive way. Today Lance has many ventures, which include acting, producing films and promoting new talent in the music industry. His close friends in the entertainment industry include teen sensation Justin Bieber, singer Ariana Grande and Justin Timberlake, to name a few. Life seems good for Lance as he says he has no regrets looking back or going forward in life, just good experiences and wonderful friendship with many of the people he has met on his journey so far. I am a great believer and try and follow by the rule book three virtues in my life every day and that is Love, Compassion and Forgiveness. By following the forgiveness path Lance Bass is certainly in a good place in life, surrounded by many friends, family and well wishers.